We have begun this post by studying the influence of water on lighting for wet surfaces. Then we have seen two real time implementations with analytic light for both optical phenomena which were inherited directly from the observation. They have some drawbacks, they miss an image based lighting implementation and their cost for in-game usage still a problem for XBOX360/PS3 game. In computer graphic there is a different path available to simulate optical phenomena other than changing the lighting model. We could simply create/edit/capture both wet and dry surfaces BRDF parameters (diffuse, specular, specular power…) with the same lighting model. This is not really a “simulation” as we know the final wet state of the surface but we are now able to render wet surfaces and to dynamically wet our game world. Simply interpolating between dry and wet BRDF parameters without changing the lighting model do the effect. Nevertheless this approach is stuck to the subsurface scattering events inside the wet material and its top, i.e the diffuse and specular of the wet surface itself. It will not allow to simulate the dual layering lighting we have study in part A when there is a thin layer of water on the top of the wet surface. I will discuss this point later. The benefit is the simplicity of the process and we still compatible with any kind of lights: image based lighting and analytic. The drawback of requiring a dry and a wet set of BRDF parameters by surfaces is the time to author and store them. The wet lighting model approach required more instructions whereas this one require only few extra instructions (but this still two textures fetch for the blending). However in game development, doubling the storage in memory/disc space and the number of textures to author is prohibited. Hopefully we now know that’s we can express both wet and dry surfaces with the same lighting model, so maybe we can find a way to tweak the dry BRDF parameters to get an approximation of the wet’s one and thus avoid the inconvenient of storing and authoring new textures. Almost all games I know chose to follow this BRDF parameters’ tweaking path : Stalker , Uncharted 2/3 (on the main character), Assassin’s creed 3 , Crysis 2/3, Metal Gear Solid V  etc… This is not surprising as the method seems simple and it fit very well with a deferred shading renderer: You can tweak dry BRDF parameters in the G-buffer without complicating the lighting systems. However the wet BRDF parameters generated by these games are either coarse or wrong approximation (in a physical sense, I am agree that’s visually the look can be Ok). Most use the same eye-calibrated factors to attenuate diffuse and boost specular (old fashion) on every wet surfaces of the scene regardless of material properties (roughness/smoothness, porosity, metalic/dielectric…). Assassin’s creed 3 even does an additional wrong step by changing the strength of the factor based on the type of rain. Remember from part A that under any type of rains a porous surface can be water saturated. This only depends on water precipitation volume and exposition time. A bit differently Tomb Raider : A survivor is born  use “dark light” to attenuate the light receive by the diffuse part of the wetted surfaces, the specular part is modified as other games. As they use lights to produce rain with a light prepass renderer, I think they intent to make up the missing of a diffuse parameter in the small G-Buffer with this method. Which again apply wrongly the same modification factors on all dry surfaces. One of the purposes of the remainder of this section is to improve the BRDF wet parameters generation from the dry one. I want to highlight the benefit of PBR for this parameters generation. I will begin by talking about the tweaking of the diffuse (or subsurface scattering part) and the specular parameters for porous dielectric material then for other kind of materials. I will end with the effect of the thin layer of water which can accumulate above surfaces and the case of thick accumulated water like puddles. Disclaimer all color values I will talk about are in RGB linear space, not sRGB space. All graph show here are available in a Mathematica file at the end of this section. We aim to found a factor which can be applied on a dry diffuse parameter to get a wet diffuse parameter and equivalent for the glossiness parameter. I will begin by an overview of previous works, they are all focus on rough dielectric material. For asphalt in driving simulator, Nakamae et al  use a factor between 0.1 and 0.3 to attenuate the diffuse albedo and a factor of 5 to 10 to boost the specular (not PBR). As many other, they perform an empirical calibration for this coefficient without taking into account the properties of the surfaces. They further show that the wet albedo is a non-linear function of dry albedo, with low albedos reduced more by wetting than high albedos. 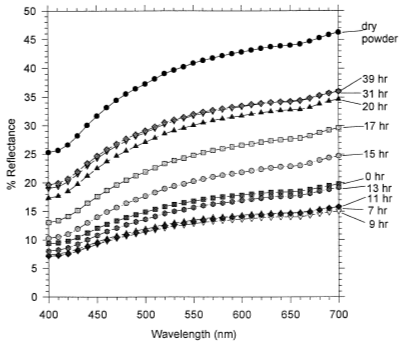 A consequence of this result (not explicitly stated in their paper) is that wet surface color is more saturated than dry surface color, because the wetting further exaggerates the differences in albedo for different wavelengths. If we take the example of a dry worn asphalt surface of 0.12 albedo, using the second graph we get the factor of 0.68 allowing retrieving the wet value of 0.08. (In Photoshop sRGB this transforms 97 to 81). 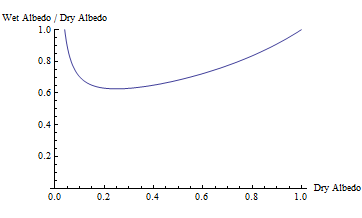 For very low albedo ( < 0.039), the curve goes above 1.0 (Not show on the graph). This is probably because water albedo (pure water is 0.02 at normal incidence, but orientation and impurity should increase it) is greater than these low albedo values causing a brightening of the dark surface. Remark instead of converting from dry albedo to wet albedo, it is possible to go the other way and use wet albedo to get dry albedo like detailed by . The paper in  highlight that’s both model should be taken into account (In fact, that’s what we have describe in part A of this post) and two parameters should be added: fraction of translucent particles (quartzlike particles with a low absorption coefficient and low internal scattering) and microscopic roughness. 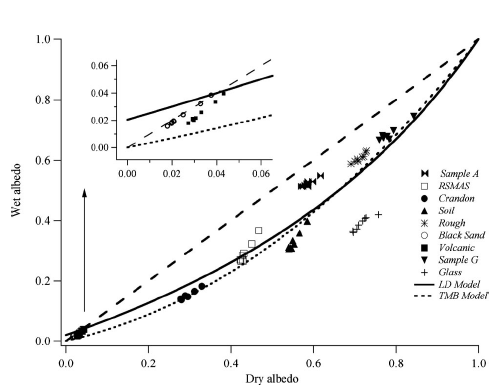 The difference between dry and wet albedo increases with increasing translucent particle concentration. And a rough surface will scatter light more diffusely than a smooth surface, if a thin layer of water is present on top of it, there will be more hits of the water air interface at larger angles causing more internal reflection and increasing the darkening effect. So the LD and TBM model aren’t sufficient. We also require to have a separate factor for diffuse and specular part but the albedo here contain both, suggesting that’s the diffuse factor could be more than the minimum 0.68 of LD model. Other works have gathered a set of real world measurement of dry and wet materials available publicly . In  Gu et al. have measured the drying process of several materials. They have registered images at different time interval for different views and lightings configuration. To be able to transfer and control the captured drying process in rendering applications, they have fitted measured BRDF to parameters of a Torrance-Sparrow BRDF (A microfacet BRDF). To be clear, they have been able to generate a diffuse component (exactly what we are looking for) and a specular component (roughness + specular reflectance) to simulate the drying process with one physically based lighting model as used in game. All materials of the database are rough dielectrics. The first thing we remark is that there is no real pattern and the darkening is color channel dependents. The diffuse albedo values are high compare to the one present in LD and TBM works because they are not normalized (divide by PI) (see Torrance-Sparrow BRDF section 4.2 of ). The range of the diffuse factors (second graph) is also higher than for LD and TBM: From 0.2 to 1.0. The reasons for this may lie in the fitting process, the absence of specular (LD and TBM albedo include specular), the calibration of the capture devices… For low albedo (if we divide by PI, around 0.02), we have value going above 1 (clip on the graph here) showing a similar behavior of LD and TBM model. 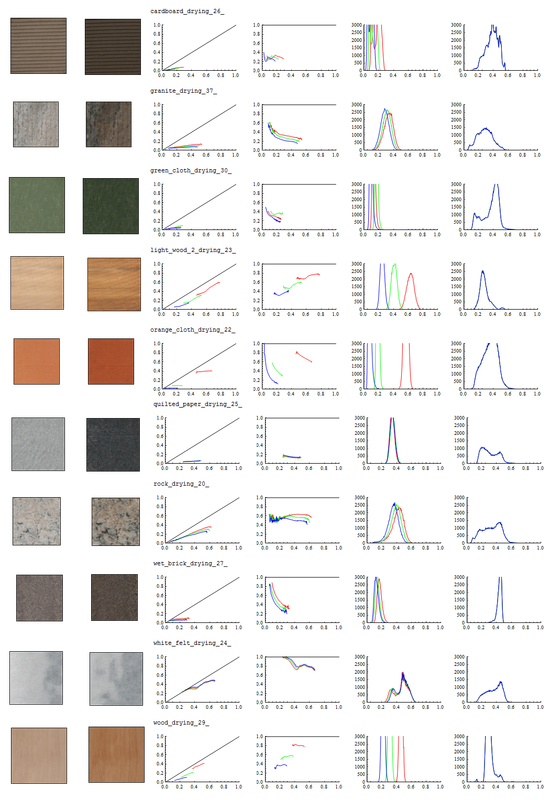 We note that’s some wet materials can be simulated by simple RGB uniform scaling, for example Wood Drying 29 wet albedo can be get by applying (0.82, 0.58, 0.38) on the dry albedo, but most materials have variation. I should advice that’s the method I use to compare materials make sense only if most of wet / dry ratio are equals, but there is a large standard deviation around the mean for the rock and the brick material so result must be taken with care. Other materials have a standard deviation < 0.1. So we don’t see clear pattern as in LD and TBM model but as said the albedo definition here is different. We have materials here which behave as expected: see granite drying 37, rock drying 20 or wood drying 29. Wood drying 29 is the one show in  for most of examples. But strange enough, some materials seems wrong, like light wood 2 23 and green cloth 30 which are less specular when wet than when dry. I can’t explain the reason of this… Regarding the shape of the curve of Ks or sigma, it seems that there is often one of them which are similar to the shape of the curve Kd. This remind the wet porous material BRDF (Part A of this post) which suggest that’s the diffuse porous part should be change to a specular water lighting contribution when wet. From this observation, I suggest to reuse the factor use to darken the diffuse to modify the specular. The database is fitted with Oran-Nayar instead of perfect lambertian BRDF for the diffuse but I am not showing the diffuse roughness here. Again the data show the channel dependant factor and the large range of the factor (0.38-1). There is also value of diffuse color which goes above one and sigma value not available, this may related to the method of analytic BRDF fitting employed in this paper. To conclude with these databases, my point of view is that’s they miss important information to better understand the relationship between dry and wet material properties: the nature of the surface. Having the measured porosity and roughness of the surface would have been useful information. The deduced roughness resulting of data fitting is not really accurate. Moreover, this should be fit to normalized specular term to be more meaningful. If interested here the Mathematica file pdf containing all the graph above : TimeVaryingAppearance.pdf and here is a package containing the C++ program (visual studio 2008 runtime) allowing to extract all information from exr image of the databases with some batch and the Mathematica notebook:ExtractInfoExr.pdf (As WordPress do not support zip file you must right click, save as… then rename the .pdf as .zip). Coming back to game development, what can be done ? We now know that’s low albedo, rough and porous materials tend to have larger wetting effect. We also know that’s high albedo, smooth material or no porous tend to be less affected by water. The handling of different varying factor by channel color with a curve similar to LD or TBM could be a little costly. We will stuck to monochromatic factor here to reduce the storage cost (and in several case it is sufficient) and we also won’t use albedo dependent factor because the curves handling even simplified add too many instructions. Anyway, if you use physical albedo value for your physically based lighting model, you should rarely have extreme albedo, remember that’s darkest material is 0.04 (charcoal) and brightness is 0.9 (snow). It is simpler to just rely on roughness and porosity. In this case we have a porosity textures which go from 0 for no porosity to 1 for “full” porosity. 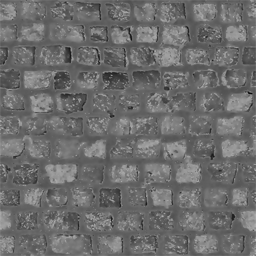 The porosity is a grey texture which can be include in a free channel of any texture at low resolution. The meaning of the porosity parameter here is not really physical as we are not using any porous BRDF. This is instead the strenght of the factor we want to apply to the dry albedo. The texture should be authored by artist, best could be to take calibrated albedo texture  from the wet and dry surface, then use the ratio as porosity but in this case we come back to our original problem of authoring time. Another prefered way for production could be to start from the gloss texture and then removing all smooth values then blurring and tweaking. Smooth part can’t be porous by definition. Note that’s porosity can vary in a noise-like pattern between location , similar to glossiness. If more physical porosity is required for other aging or weathering effects, a simple remaping from 0 .. 1 to 0 .. 0.5 (50% porosity) could be sufficient. For our calculation, we will use a diffuse darkening factor on the dry diffuse and as suggested we will reused this factor for the specular boost. About the specular boost, with a physically based lighting model we only require to tweak the glossiness. The normalized specular automatically handle the increase of reflection with the reduced shape of the highlight. The use of a preconvolved cubemap chain indexed by glossiness allows to automatically adjusting the water reflection. The change in specular color (i.e the index of refraction) induce by the water saturation is not visible enough in game to be take into account (we go from 0.04 for common dielectric to 0.02 for water). The glossiness should affect the factor only if rough and can have a linear decrease with lower roughness. I remap glossiness with equation ((1-Gloss) – Start) / (Start – End) to control this. Start and End depends on the glossiness convention and the glossiness range of your engine. Start should be the value where a surface can be considered to be too smooth for water to penetrate inside it and End the value where the surface is so rough that’s we consider it fully porous. In my case, gloss is 1 for smooth with a range of 1-2048. The above code gives the following left graph. The right graph shows the conversion from Glossiness to Specular Power as reference. Here Start is equal to 0.5 mean a specular power of 45 (or a RMS slope of 0.2) and End is equal to 0.1 meaning 2. The remap can be written in a single mad_sat in all case, here I get: saturate(-2.5 * Gloss + 1.25). The dot instruction allows handling case like gold metal (1, 0.76, 0.33). Note that’s this will also cancel the specular boost which is what we want as the smooth specular in this case come from the thin layer of water. When porous material is water saturated or when we have a smooth or metal material, a thin layer of water accumulates on the top of the surface. This layer could not be simulated by tweaking BRDF parameters and require a dual layer BRDF. But as we see, a dual layer lighting model is expensive. Jensen et al. in  have implemented a lighting model with the subsurface scattering and the thin layer of water linked to wet surfaces and they have found that’s the consideration of water inside material have the more dramatic effect. The subsurface scattering is the most significant reason why materials are darker when wet (And the subsurface scattering allow rendering the increased translucency of thin materials caused by the absorption of the water (like paper, cloth)). So for rough/porous material handling double layering is not really needed. And for metal/smooth material we have seen that’s the absorption of the water, the refraction and the total internal reflection have not an important impact for such a thin layer of water. This doesn’t mean we will do nothing. When we have a thin layer of water we still have a reflection corresponding to a disturbed normal from the underlying surface. 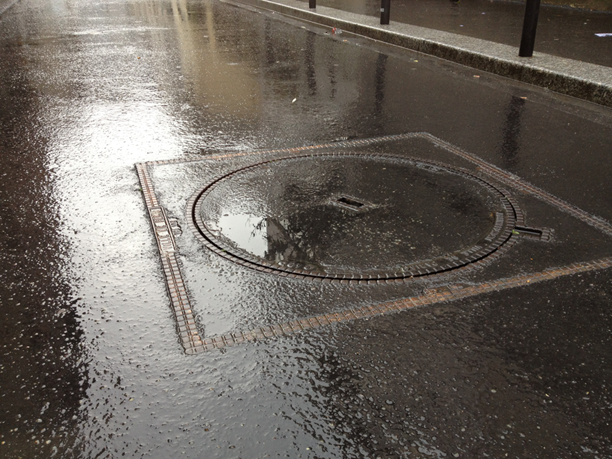 For thick layer like the puddle on the manhole we have a perfect reflection coming from flat normal. Thus using a progressive blend between normal map and vertex normal can provide visually correct result for increasing height of the water layer. I will not provide code for this post as the RenderMonkey application of Water drop 2b – Dynamic rain and its effects contain almost all the code we need. By replacing the code of the DoWetProcess() by the one of the previous paragraph we get our physically based wet surfaces rendering approximation. The AccumulatedWater variable of the code simulate both the thin layer of water and the puddles. By adjusting the heightmap/vertex colors values of the surface you may influence the size of the top water layer. – For wet region (type 2) we have the DoWetProcess() function which apply the PBR darkening of the diffuse and the specular boost. – For the thin layer of water which can be considered as drenched region (type 3) we have a small amount of water in AccumulatedWater causing a slight smoothing of the normal and a slight boost in specular (smaller highlight, better reflection definition, increase in intensity). – For puddles (type 4) we are totally flat and have blended to water properties. The system describe here provide good results, is simple to implement and is suitable for XBOX360/PS3 games. In Remember Me as we ended with static weathering condition we have use only a small part of what was presented here. The rain being static we have created wet textures for everything. This is a gain in quality as artists have full control on the rendering and in performance. This is the morality of the story, fit your features to your game context. 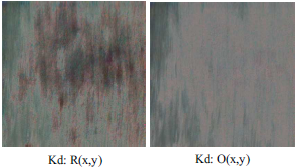 Additional nice picture of darkening of wet surface with highlight of the saturation are available in . 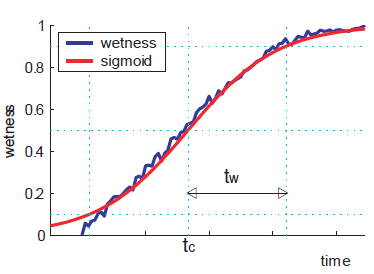 Water will have the same normals as the underlying asphalt if the water layer is thin, but it will “fill” asphalt discontinuities if it thick enough. That’s easy if the asphalt has a normalmap, we simply interpolate that with the original geometry normal proportionally with the water level. The lerp is too grayish, the shift a little strong but it bring the hue shift we are looking for. That’s why I try a mix between shifting and lerping. The last texture is not rather good. I have not push the test further but this could be an interesting way to quickly generate wet textures. However converting to spectrum still an unsolvable problem so result will never be correct. If interested here is the application with the source code: SpectrumShift.pdf (As WordPress do not support zip file you must right click, save as… then rename the .pdf as .zip. C++ (visual studio 2010 runtime)). The application takes a factor for the shift, a factor for the lerp and any number of images in tga format. I add 4 textures above in the package. When managing dynamic rain, we also need to look at drying and wetting process. where  and are the albedo of the material when fully dry and wet and  is the sigmoid function. In game, it is obvious that’s we won’t go so far in the detail. A simple generic noise mask texture could be use with a sigmoïdale function or even a simple lerp to attenuate differently the wetness. As stated in previous post, if the player can’t notice it there is no need to implement the effect. Using real world time values for drying process is useless (> 30 min). Basing the drying speed on weather condition (heat, wind..) has almost no chance to be noticed. Game could simply lerp quickly (1 min) to dry surface state without taking into account the specular exponential decrease. Special care need to be taken for thick layer of water on top of wet surface like puddle which should not dry as quickly as the other area. 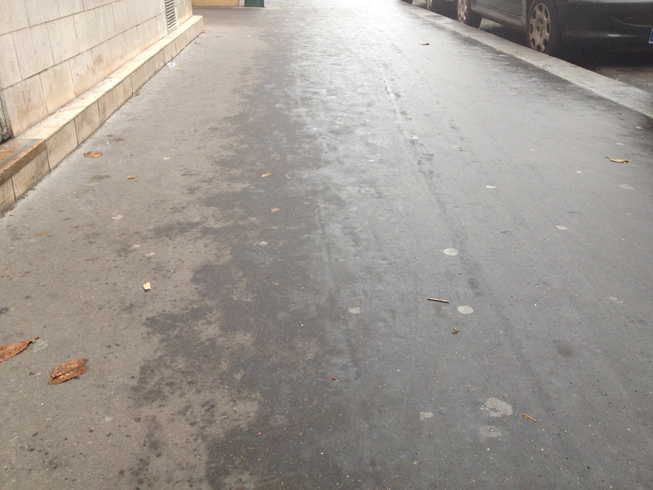 The RenderMonkey application of Water drop 2b – Dynamic rain and its effects implements such a drying with puddles. Note that’s there is no real drying process for no porous material. The thin layer of water will simply evaporate. The process of wetting is a little different as surfaces are almost instantaneously wet when they are hit by water. The main process which occur here depends on the water quantity receive by the surface which will determine the saturation of the porous material and the creation of a thin layer of water. I don’t find any computer graphic research on this topic. An interesting technique to generate wetting or drying effect is the “dynamic paint” tools from Blender. This can be use to generate dynamic wet map  or a start of a rain as show in this youtube video or this one. There is an interesting paper on flow simulation going through a porous material . This graph is available in the Mathematica file of the previous section. The roughness data are a bit odd so not all material have data. We see many thing in this post helping to understand the physical process involve in the darkening and brightening of wet surfaces. Wet surfaces are really complex to get right and the complexity involve is difficult to master in the context of game development (dual layering, porosity, subsurface interaction…). I myself still don’t get all. Hopefully we see that’s we are not forced to construct a complex lighting model to get good wet surface feelings, simply tweaking BRDF parameters from dry material do the job. The main point I want to highlight is the great benefit of using a physically based lighting model with physically based values. From physical parameters you are able to identify the nature of surfaces. Useful information when you deal with procedural effect based on aging and weathering. To conclude, this post has show me that’s current measured material miss important information like measured roughness and porosity. We need better acquisition process. 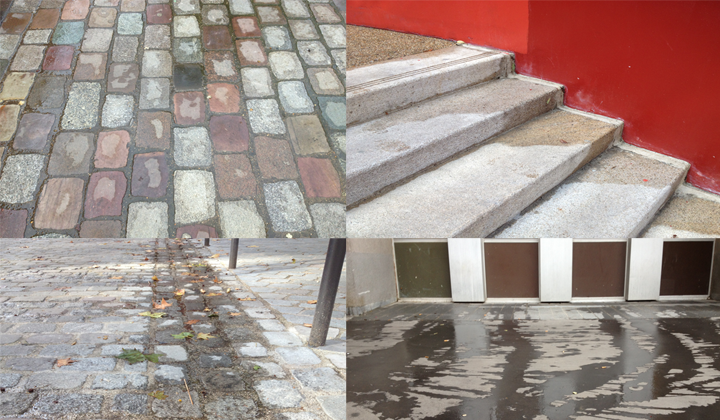 Moreover, too few study have focus on the specular boost of wet surfaces. There still other subjects which have not be taken into account here. The translucency of material when wet (cloth, paper…) and more complex lighting for dual layering like rough coating. You are The God! Impressive, thanks a lot. v1.1 Minor rewrite for better explanation of several sentences. V1.2 : Rewrite of part “1. With a porosity scalar” “2. with porosity mask” “3. without poristy” and “Metallic and smooth material” which were incorrect. V1.3: Add a figure from source  for the spectrum manipulation and add some sample of rough non-porous surface (vinyl, leather, textured surfaced…) in the text. This illustrate the need of at least a porosity mask to be more correct instead of simply relying on roughness for the darkening. …never reaches the original gloss-values, right? Even setting the wetLevel to 0.0 would result in min. 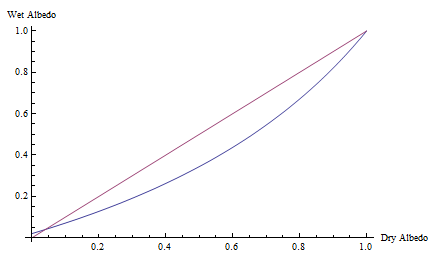 factor of 0.2 and therefore the minimum lerp-value would neve be 0.0. Or did I oversee something?